It’s my favorite time of the year! 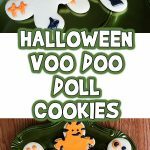 I absolutely love Halloween, so be prepared for a whole bunch of super fun crafts and recipes coming your way this month! 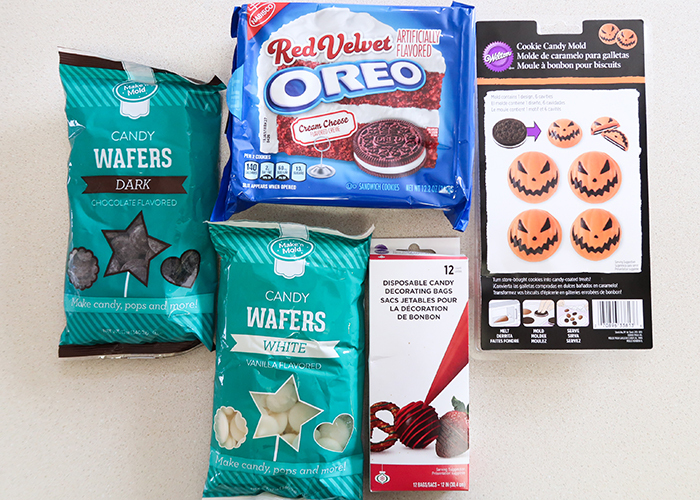 Today I have a Halloween Candy Coated Oreos Tutorial for you. 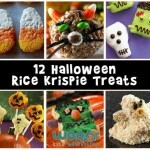 These are so much fun and are great for Halloween parties! 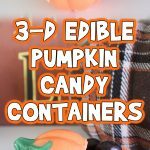 The traditional way of making these is pretty difficult and messy even for experienced candy makers, so today we’re going to use a mold to make the process so much easier. I am all about finding ways to make things faster and easier! Sandwich cookies. I prefer Oreos, but use your favorites. Cookie candy mold. Many different brands make these now, so there’s lots of options. Start by washing and drying your mold throughly. And drops of water can cause candy melts to seize up and act funny, and you don’t want that. 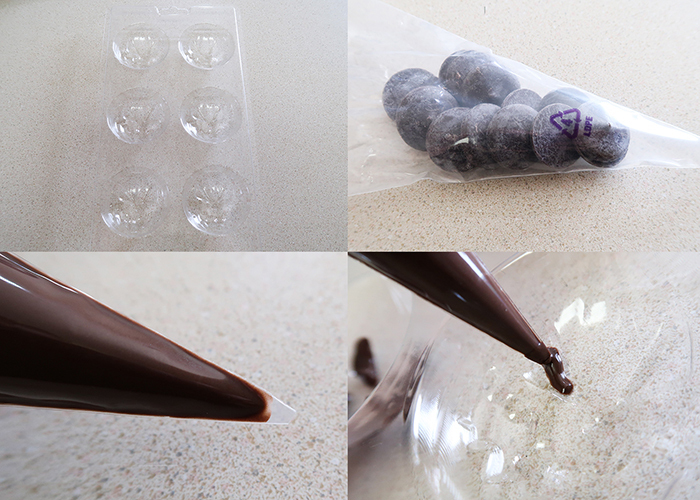 Place a small amount of your dark brown candy melts in a decorating bag, and heat them in the microwave at 20 second intervals until melted. Cut a very tiny bit off the tip of the bag. You want a tiny hole because you’re going to be filling in the details of the pumpkin. Carefully fill in the details, keeping a paper towel nearby to clean up any mistakes. 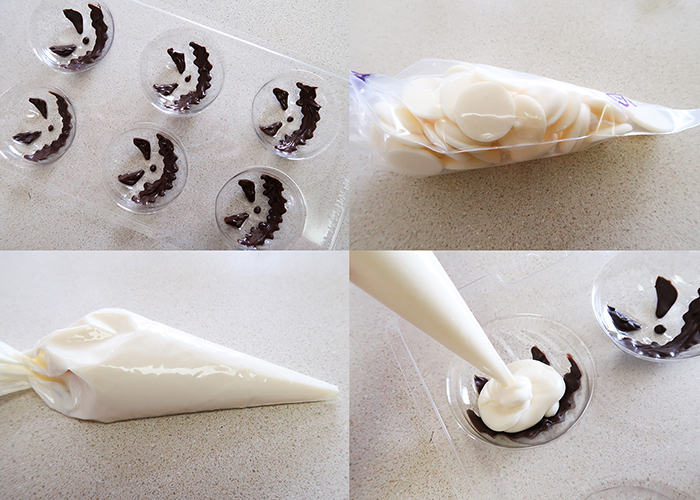 Fill in all the face details, then place the mold in the fridge for 10 minutes to help the candy set quickly. 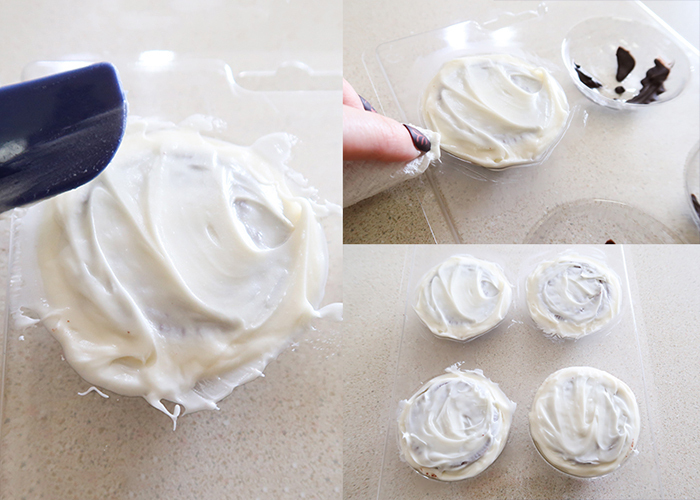 Fill another decorating bag with white candy melts, and melt those in the microwave as well. Then fill the mold with the white chocolate about 2/3rd’s of the way full. 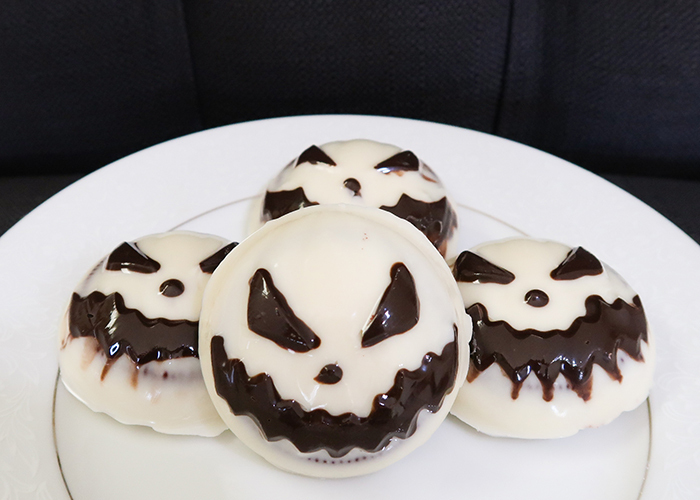 Take your cookie of choice, and press it down into the mold, allowing the candy to fill in around the sides. Do you best to press gently and straight down to avoid disturbing the facial details. 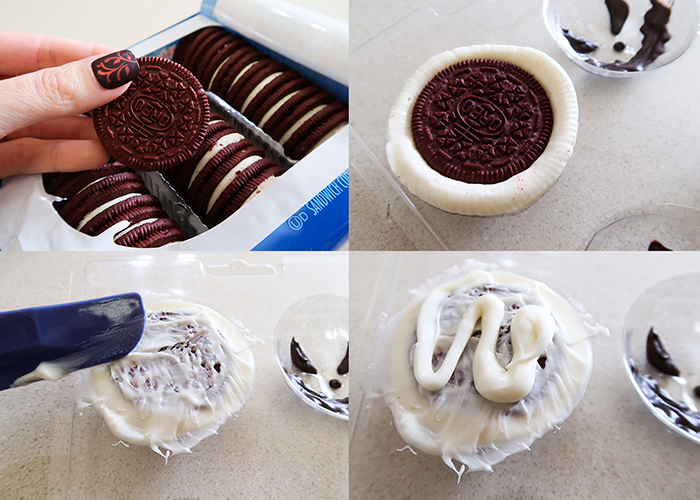 Now this particular mold was designed to have the back of the cookie showing. However, I find that that leads to stale cookie backs. So I used a spatula to sooth the extra chocolate over the back of the cookie, and added a bit more and smoothed that over as well. 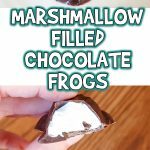 If you’re a messy candy maker like I am, use a bit of paper towel to clean up the edges. Repeat until your mold is all full! 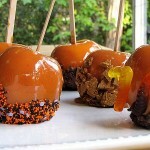 Set the pumpkins in the fridge for 15 – 20 minutes to let the candy completely firm up. They should fall cleanly out of the mold with a gentle tap on a counter. And you’re all done! The great thing is that even the faces that smudged a bit still look great. Plus, it makes them even more spooky! 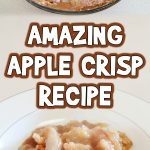 These store great at room temperature for a few days, and coating the cookie completely keeps it tasting fresh. Feel free to experiment with colors! 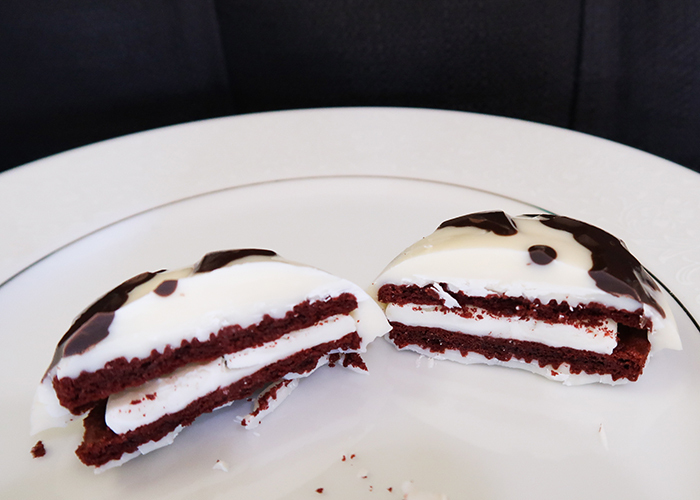 I used red cookies with a white coating for a more spooky cookie, but you can easily match the colors to your party colors! 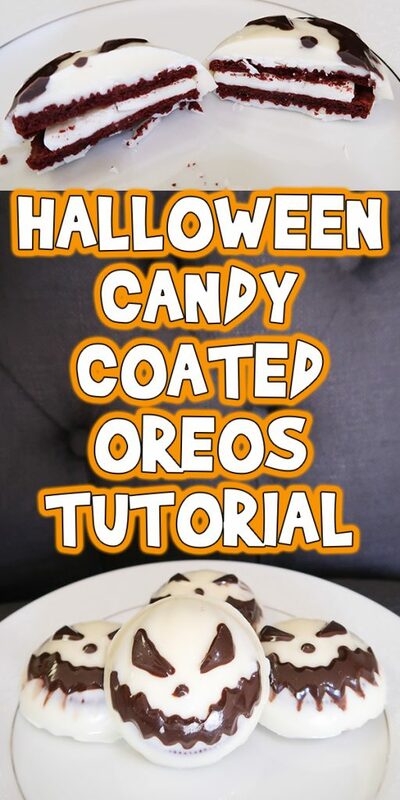 I hope you found this Halloween Candy Coated Oreos Tutorial helpful, and easier than dipping them by hand!